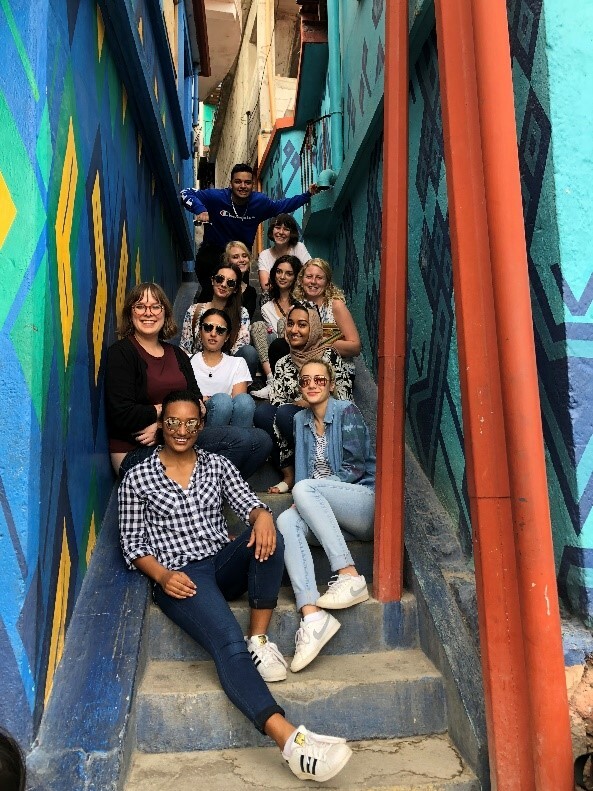 Last month I had the opportunity to travel with a group of eight LIM students to Guatemala as part of a service-learning program in partnership with Mercado Global, a not-for-profit organization based in Brooklyn and Guatemala. I’m the Study Abroad Coordinator here at LIM, but I don’t travel with every program, so it was a pleasure to have the opportunity to experience this one firsthand! 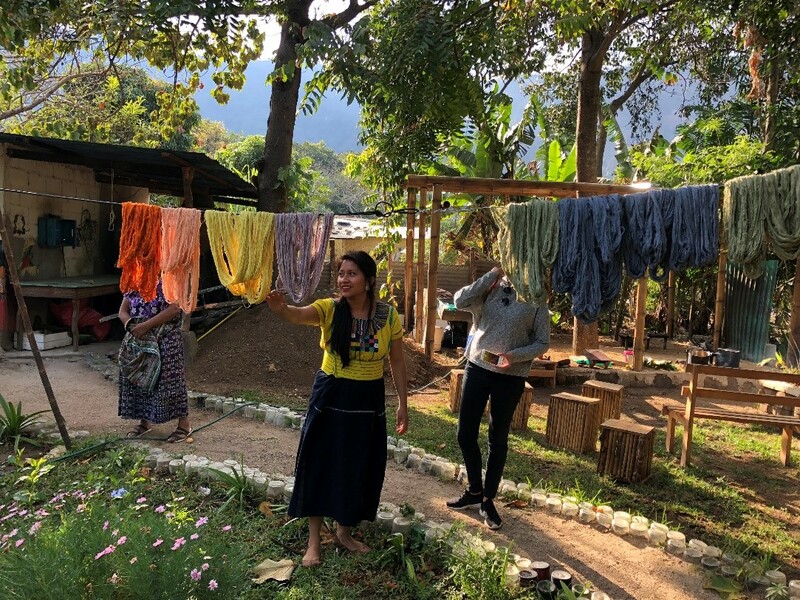 One of the first things we noticed when we arrived in the Lake Atitlán area, where we spent the majority of our time, was the way that almost all of the groups we visited had created cooperative projects with the goal of improving their communities. These projects were diverse and included one with the aim of painting the whole town of Santa Caterina in beautiful traditional Mayan colors in order to attract more tourism, and another in the town of San Juan where a group of women had formed a cooperative to preserve their knowledge of traditional dyeing methods and to sell the products they made. It was very interesting to see how united and resourceful the local communities in the area were. 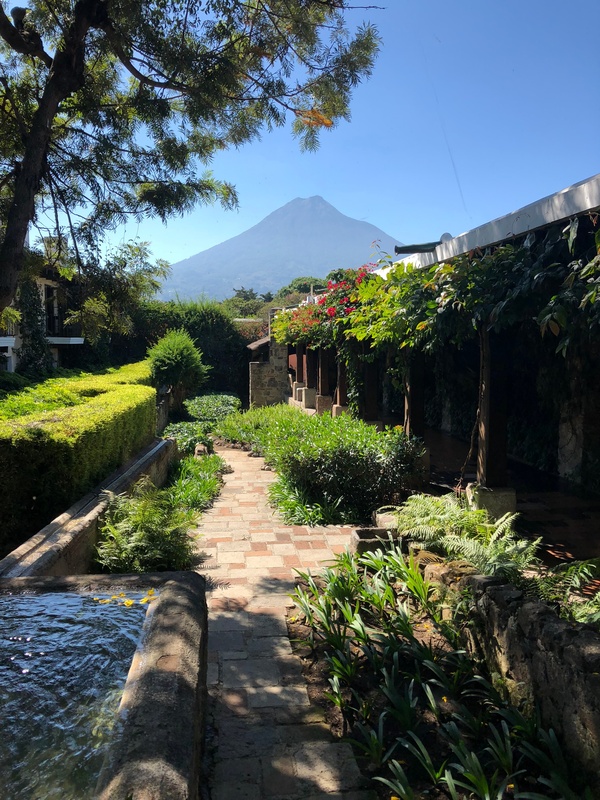 The landscape in Guatemala is beautiful – full of volcanoes and lakes — simply stunning. 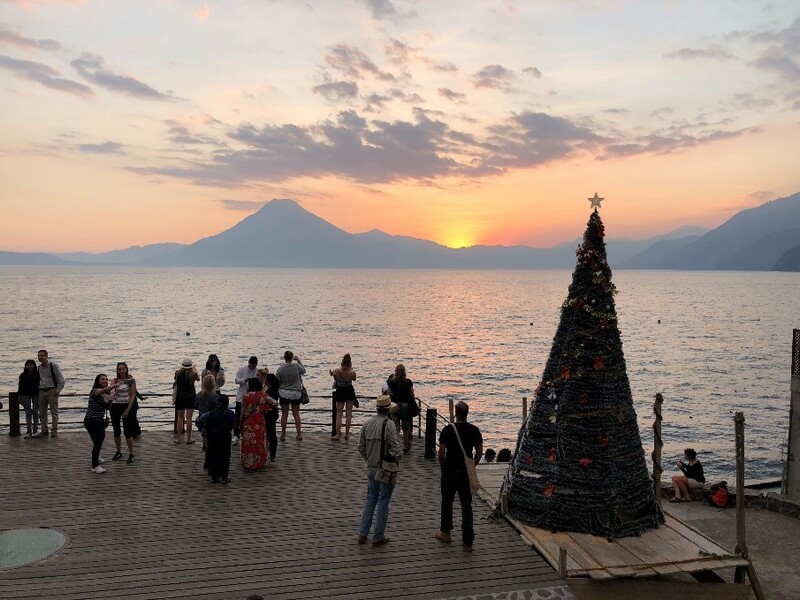 One of my favorite parts of my time there were the sunsets in Panajachel, the town where our group was based. There was nothing better than walking down to the lake at dusk and watching the sun set behind the lake and volcanoes that surround the town. The holiday decorations that were still up when we were there in early January were also a bonus! The food in Guatemala was delicious! 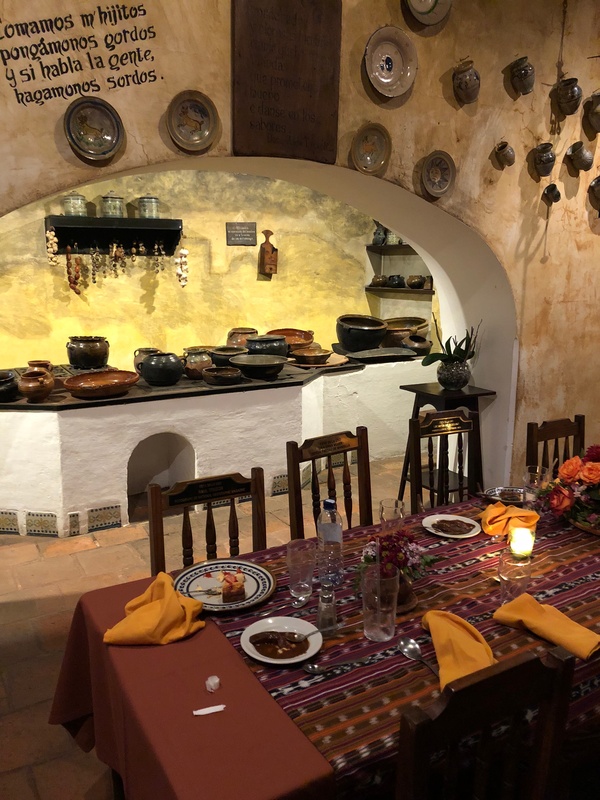 We had traditional Guatemalan and Central American dishes like chicken pepian (chicken and veggie stew in a spicy sauce), pupusas (thick corn tortillas stuffed with meats and cheeses), and rellenitos (deep fried plantains mixed with beans and sugar). We learned that Guatemalans eat corn in every possible form you can imagine – ground up into cornmeal, fried, baked, boiled, grilled – you name it, they do it. No matter how it was cooked it was always delicious! For this program LIM College partnered with Mercado Global, a not-for-profit organization that helps empower Guatemalan women by providing microloans for sewing and weaving equipment; connecting them with the international market so that they can sell the goods they produce; and offering community-based education opportunities. 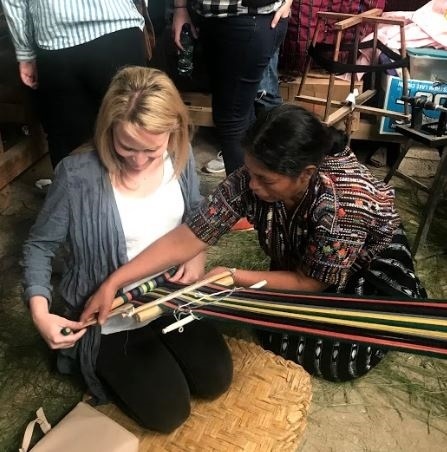 The Mercado team developed an excellent itinerary for our group that allowed us to meet artisans from several communities and see how they make their products. These included traditional weaving techniques with a backstrap loom, hand-thrown pottery, and natural dip-dyeing techniques. It was incredible to see the skill and knowledge that go into producing goods using these methods. My favorite part of Guatemala was the people we met. Everyone we spoke with was friendly, welcoming and excited that we were there to learn more about the country and its culture. It was also wonderful to get to know the Mercado Global staff and some of the artisans they work with. We learned a lot about how a not-for-profit organization works and how fashion can be a force for good. All in all, our time in Guatemala was filled with a lot of learning, good food and great people!